Last blog posts, we focused on how to find the domain and range of functions. In this blog post, we will discuss inverses of functions and how to find the inverse of a function. 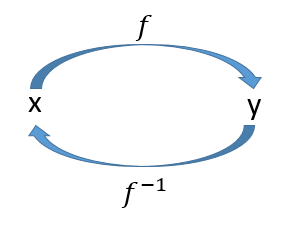 An inverse of a function f(x), denoted f^(-1)(x), is a function that reverses or undoes f(x). What does that mean? This means that the domain or inputs of a function is the range or output of the function’s inverse and the range or outputs of a function is the domain or inputs of the function’s inverse. If f(x)=y, then f^(-1)(y)=x. Let’s see some pictures to better understand. It is important to note that some functions have more than one inverse. For example, quadratic equations have two inverses because the negative and positive value for an input goes to the same y value (For x^2+4, when x = 1 and x = -1 , we get y = 5). When you find the inverse of quadratics, you’ll notice you get two inverses, one is a postive square root and the other is a negative square root. We will see an example of this later in the post. Now, that you’ve got the concept of what the inverse of a function is, we will see the steps on how to find the inverse of a function. The steps are pretty simple to remember and follow. Now, let’s see some examples. You can do this step on your own. We will skip it to save some time. As you can see, finding the inverse of a function is pretty simple. It is easy to make algebraic answers, so make sure you check your answer to see if it is correct. With practice, you’ll be able to master this topic easily. For more help or practice on this topic, check out Symbolab’s Practice.